On the ground floor there is an entrance hall, adjacent to a living room, with lounge and dining room, kitchen with outdoor access, a single bedroom, a bathroom with shower and a double bedroom with exclusive service. The first floor comprises two twin bedrooms, both of them have their own balcony, a bathroom with tub and shower and a double bedroom with private bathroom with bathtub. 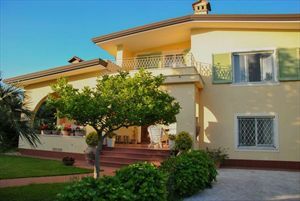 The Villa is also equipped with alarm system, air conditioning, electric gate, parking for 4-5 cars, garage and Wi-Fi.